(HARLINGEN) – The Fall 2018 semester is off to a good start for one program at Texas State Technical College in Harlingen which was just named one of the top 10 in the nation. 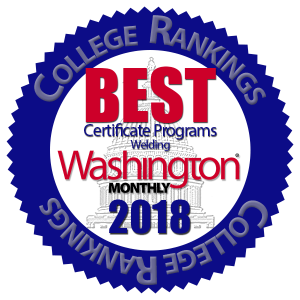 Welding Technology was recently ranked number seven in 2018 as one of the best welding programs in the U.S. by Washington Monthly, a bimonthly nonprofit magazine based in Washington, D.C. that focuses on the United State Government. Welding Technology and Precision Machining Technology Lead Instructor Isaac Gonzalez calls this distinction a great honor. Based on an article in the © 2018 Washington Monthly, “Introduction: A different kind of college ranking,” by Kevin Carey, which can be found at www.WashingtonMonthly.com, the magazine rates schools based on three equally weighted criteria: social mobility, research and public service, and awards colleges based on the number of students they accept, help graduate and earn a good living without too much debt. TSTC in Harlingen Provost Cledia Hernandez, said this distinction puts TSTC’s welding program on the map. Hernandez also added that TSTC’s focus is to provide industry-driven advanced technical skills needed to assure economic growth for Texas. “Being a statewide college gives us the ability to extend the advanced technical training to our 10 campuses and have a greater impact on meeting industry needs and placing more Texans in high-paying jobs,” she said. 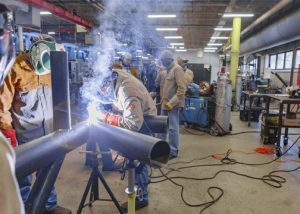 The Welding Technology program’s statewide enrollment is always at capacity, with more than 150 students a year and has an impressive 98 percent job placement rate. Moore, who has been with TSTC for more than two decades, said hearing about the high ranking was a very proud, yet humbling moment. Welding Technology offers two certificate tracks: Structural Welding and Structural and Pipe Welding, and an associate degree track. It takes approximately three to four semesters to complete a certificate or associate degree. Students who graduate from TSTC’s Welding Technology program will learn hands-on about arc welding, gas tungsten arc welding, layout and fabrication and multiple process welding. Once the program is successfully completed, Welding Technology graduates can find work throughout the state in manufacturing shops, maintenance shops, ship building yards or oil fields and steel erection operations as pipefitters, steamfitters, welders, cutters, solderers and brazing machine setters, operators and tenders. Gonzalez said welders are in high demand across the region and state. He hopes that TSTC’s recent number seven ranking will help the program grow even more, which in turn will benefit industry. To view TSTC and other rankings, visit www.WashingtonMonthly.com/college_guide/.